Bishop Lucius Ugorji and Archbishop Mark Coleridge process through the crowd after the Mass in Mater Dei Cathedral, Umuahia, for the ordination of 10 men. 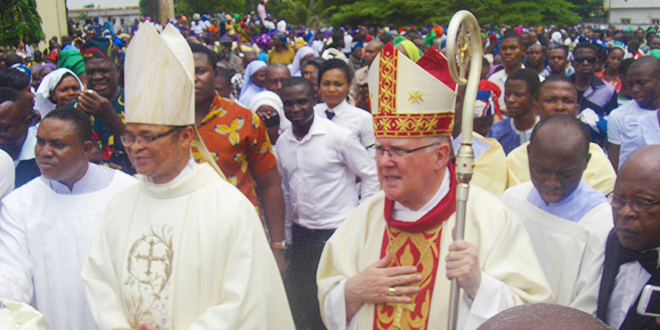 ARCHBISHOP Mark Coleridge left Brisbane to visit Umuahia diocese, Nigeria, two weeks ago expecting “a new and deeper experience of the Church”, and reports indicate he was not disappointed. Umuahia and Brisbane dioceses have a partnership which involves priests from Umuahia ministering in Brisbane, and seminarians from there receiving some of their training and formation at Holy Spirit Provincial Seminary, Banyo. As a result, Bishop Lucius Ugorji of Umuahia invited Archbishop Coleridge to visit his diocese to ordain 10 priests at Mater Dei Cathedral, Umuahia, on July 19. Before he left for the visit, Archbishop Coleridge wrote that “the real nourishment will be the human encounters, meeting the people and tasting the culture”. “These encounters are at the heart of what it means to be the Church, which is why this pastoral visit to Umuahia will be above all for me a new and deeper experience of the Church,” he wrote. Thousands of people attended the ordination Mass, which lasted three-and-a-quarter hours, and Archbishop Coleridge was warmly welcomed by large crowds of people wherever he went in the diocese.